This adventure clocks in at 24 pages, 1 page front cover, 1 page Kort’thalis glyph, 1 page editorial, leaving us with 21 pages of content, so let’s take a look! 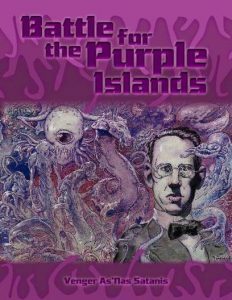 Well, as you may have deduced from my reviews, to this day, I consider Venger’s “Islands of Purple-Haunted Putrescence” perhaps the best of his adventures; it is certainly my favorite, for the combination of Carcosa-style weirdness without the constant doom and gloom (though there is plenty of bad stuff waiting to happen to everyone…), infused with healthy doses of gonzo and humor, created something that really resonated with me. Suffice to say, I was rather excited when Venger suddenly sprang a return to these unique locales, haunted by basically a Great Old One, with all the “fun” ramifications for the locals that ensues. Now, this adventure, like all of Venger’s adventures, doesn’t really sport a synopsis, though this time around, this is well justified: In a sense, this is a scenario into which PCs are plunged. How it develops and what exactly happens remains a mostly player-driven thing. It should be noted that I STRONGLY suggest getting the “Islands of Purple-Haunted Putrescence” before running this one; without its unique backdrop, the putrescence itself, etc., this loses a bit of its flavor. Also, much like Venger’s other modules, this is not something you can pick up and play – you definitely have to read the module in its entirety, preferably while taking notes, but since the preferred way to run this, is one situated within the islands, you will want to modify it anyways. It’s just important to note if you expect the level of convenience provided by quite a few of current modules. That being said, the pdf is significantly more convenient than usual for Venger’s adventures, in that it explicitly provides three different entry vectors for the scenario: One for newcomers to the purple islands, one for veterans of the place, and, since the tie with Alpha Blue has been established (in fact, Alpha Blue was, to my knowledge, first mentioned in the Islands-supplement! ), we also get an entry-vector for Alpha Blue. A big plus would also be that Venger actually included stats for the creatures encountered here: If it’s likely to attempt combat, you’ll get stats. This isn’t all, though! We do get a massive 100-entry strong table for roll-as-you-go hexcrawling: From clearing to metallic sphinxes, possessed pythons etc., the table is pretty neat and a welcome addition to the GM’s arsenal. We also get a table to randomly determine the reaction of locals to lovecraftian entities, which cover abject terror, worshiping the entity, trying to defeat it – you get the idea. An 8-entry weather table allows the GM to further enhance this aspect – though I do suggest you check out the Islands-book, for purple rain there…well. You’ll see. Now, I should mention that the fully-developed entry vectors do add an in medias res angle that can dramatically change the circumstances of meeting the person that kicks off the action…but to tell you more, I need to go deep into SPOILERS. Potential players should jump to the conclusion. All right, only GMS around? Great! So, perhaps the PCs are half-delirious and hanging, captured by cannibals over a pit of sewage, as he is thrown into their cage; or, they encounter an ape-men-patrol hunting for the fellow, but things begin when the PCs meet this man from the Guild of Purple Prose, one Stenz B’wca – this purple-spandex-wearing fellow is on a crucial mission, namely to save the universe. He must find none other than H.P. Lovecraft and convince him to write his tales. You see, Lovecraft, dejected by refusals to be published, lives the life of a hermit on these islands, as he managed to venture here via the Dreamlands. Oh, know what? He’s guarded by shadow shoggoths. Yeah, it won’t be easy to get to him. Anyways, the middle section of the module beyond the entry vector is, as you can glean from the different starting positions, very much is a dynamic field that oscillates between the actions of and interactions with the factions herein: Each of them comes with stats for rank and file members as well as for the leader, if applicable. Here, we embrace Venger’s gonzo Sword & Sorcery to the full extent: We have the cannibal tribe of the Uba-Tuba, with notes on typical behavior and a 12-.entry table for strange customs of such cannibal tribes; when the crescent moon is in the sky, one of the last snake-men named H’ssan, with deadly apparitions, comes down from the mountains to procure sacrifices; there would be the ape-men and we can encounter the deadly Brotherhood of the Unquiet Void – a cult of the old ones, inspired by their profane messengers, who has instructed them to create the Purple Missile: A missile that is bound to spread extreme, sanity-destroying mutation-causing radiation over the islands…there is just one component missing. An indigo crystal. A Crystal that also contains the hologram that Stenz is supposed to show Lovecraft…yeah, this directly puts the PCs at odds with the powerful brotherhood. The crystal’s hologram does have a surprise: It’s Lovecraft, 20 years down the line, talking to himself, giving words of encouragement and pointing him towards an old art museum, situated at the bottom of a deep crevasse. Entering the weird museum, the PCs can find all sorts of strange things…and accompany Lovecraft to see the movie. Well, smart PCs will wait outside. The movie will do its job really well, but characters may well become permanently-changed by attempting to see the film. Editing and formatting are top-notch, I noticed no significant hiccups. Layout adheres to the neat 2-column full-color standard of Kort’thalis Publishing, with splotches of dried blood, purple veins etc. making the pdf aesthetically-pleasing. The pdf sports a ton of really nice b/w-artworks, all original pieces that highlight the weirdness of the islands. The pdf comes fully bookmarked and sports a second, more printer-friendly version. This is Venger at his best, simple as that. We get a glorious mix of pulp, sword & sorcery, horror and some subdued meta-references (without relying completely on them) and even a bit of humor. The blending of these aesthetics and themes works to the module’s advantage, making it feel more unique than his trinity-modules, for example. While the organization isn’t perfect, and while there are modules out there that are easier to use, this is a huge leap in the right direction and frankly, considering what this is, I am perfectly fine with how this is presented; this is a sandbox/toolkit, pure and simple. While I tend to really enjoy Venger’s adventures, this is the first in a while where my rating doesn’t come with a caveat; the increased number of stats, the improved structure – this is a really cool set-up for another trip to those thrice-damned purple islands, where all manner of horrors lurk and almost everything is possible. While it would be nice to have names bolded, a synopsis, etc. for easier go-and-play use, this is pretty much my only valid complaint against this, and frankly, considering what this is and tries to be, it doesn’t feel fair. This is a brief set-up for a frame-narrative and a series of strange factions that coalesce into the plot and sequence you create; it has to retain this open structure to maintain compatibility with the diverse iterations of the Purple Islands out there (which, as you know, can go a LOT of different ways…), so as far as I’m concerned, the wide open nature is a here a feature, not a bug. In short: This left me more excited about future modules by Venger than any of the Trinity-modules. Get the Purple Islands-book, then get this one. Marvel at the glorious, combined madness. My final verdict will clock in at 5 stars + seal of approval. You can get this delightfully gonzo module here on OBS! You can get the amazing “Islands of Purple-Haunted Putrescence” here on OBS! Venger has currently funded a saga for Alpha Blue – the KS has surpassed the funding goal and can be found here, with 7 days to go! Thanks for the review, hoss! I felt it was time to return to those thrice-damned islands (as you called them). Glad it was a good outing! Combining one with the other and then some more stuff will only increase our consensual madness… Hahaha!! !